Three varieties of artisanal salame are joined by stone ground mustard, organic Greek olives and more in this savory, shareable crate. With a personalized tasting board for serving, it's a perfect gift for any foodie or culinary adventurer. Cerveza Seca Dry Cured Beer Salami. Salami Piccante Dry Cured Spicy Salami. Campo Seco Dry Cured Country Sausage. Organic Green Greek Olives, Stone Ground Mustard. Each gourmet item is carefully assembled, and the gift arrives presentation-ready in our signature gift crate. A free card is included with your personal message or greeting, as well as complimentary scissors so your recipient can easily open their gift. Free Engraving! Engraving area: Single initial on maple tasting board. Enter initial to be engraved using the Personalization Option during checkout. 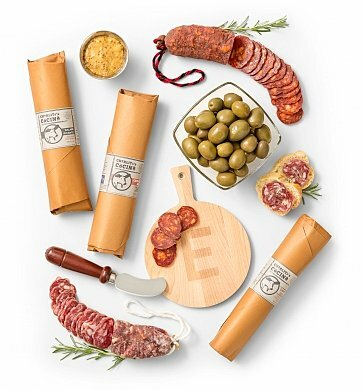 Charcuterie and Personalized Tasting Board Gift is a hand delivered gift. These gifts are delivered by one of our local design centers located throughout the United States and Canada. Same day delivery is available for most gifts when ordered before the cutoff time. The cutoff time for Charcuterie and Personalized Tasting Board Gift is 2 PM in the recipient's time zone. Campo Seco Dry Cured Country SausageEarthy and rustic, sophisticated, yet totally accessible, the Campo Seco is made simply from pasture raised, heritage breed pork, and cured with a mineral rich, gentle, yet complex fleur de sel. Salami Piccante Dry Cured Spicy SalamiSalami Piccante is a spicy salami with red peppers and several varieties of paprika. There's a bit of heat, but not so much that it overwhelms the great flavor of artisan cured salami. Cerveza Seca Dry Cured Beer SalamiBold and subtle with a robust autumnal warmth, Cerveza Seca demonstrates how the use of beer in the curing process can produce a flavor so enchantingly unique, that it eludes classification. Round Maple Cutting BoardThis wood cutting board is functional, reversible and handcrafted using beautiful maple wood. Like trees in the forest, each cutting board has its own unique grain. Imported artisanal salami and country sausage. Organic green olives, stone ground mustard and more. Arrives in GiftTree's exclusive signature crate.